Pub just off Shoreditch High Street. It closed for a full refurbishment some time in mid-2010, with Fancyapint reporting that the interior had been entirely gutted. It reopened in October 2010 under new management. The comments below relate to the situation under the previous management — we haven't yet visited to see what's changed, but Time Out and Cheese And Biscuits have. Pub just off Shoreditch High Street. 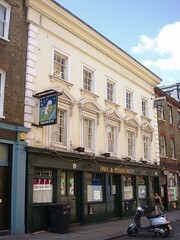 An old man's type pub, rather than yet another one of the trendy bars more common to the area. Kake and Bob visited around 6:30pm on a Tuesday evening in October 2007. It was fairly quiet when we got there; no music, and indeed we were the only people actually having a conversation. Music and a few more people arrived a bit later on (jukebox?). We left for dinner after a pint so it might have got noisier later on, but it was fine while we were there. The only real ales on offer were London Pride (£2.90) and Greene King IPA; there were other handpumps but the clips were turned round. The Pride was OK but not wonderfully well-kept. We spotted a bar billiards table, but don't know if it was working. There's a piano in one corner but it's stuck behind a table so again, don't know if it ever gets used. Beer garden out the back, apparently, and a restaurant of some kind upstairs. A blackboard advertised sandwiches and toasted sandwiches, all around £4.50, and all served with chips, but I don't know what times they're served. Ditto with another blackboard advertising main courses (£6.25 for home-made burger up to £12.50 for 12oz sirloin steak). The interweb suggests the Sunday carvery roast is good. The interweb also suggests that the landlord is rather grumpy; if the chap who served me was the landlord, then I found him more disengaged than actively unpleasant. Last visited by Kake and Bob, 17 October 2007. Comment added by Sean: Last visited on 2/9/2008. London Pride and Brakspear this time. Bar billiards is fully functional - it's Marna's favourite. There's also a TV for sporting events, but it's usually turned off. Last edited 2011-06-26 14:31:33 (version 17; diff). List all versions. Page last edited 2011-06-26 14:31:33 (version 17).